Genesis Sonic the Hedgehog 2 (any,r1) in 17:40.08 by Zurggriff & Aglar. Sonic the Hedgehog 2 (1992) was the game that introduced the Super Dash Attack. The ability, referred to as Spin Dash in later games, has become one of the most beloved features of the series and, indeed, one of the most prominent features of the speedrunning scene as a whole. In this exhilarating movie, Aglar & Zurggriff speed their way through this classic's varied acts making good use of Spin Dashes to finish them in record time. 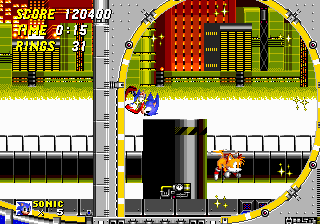 The authors also control Tails — Sonic's two-tailed foxy buddy — to allow for even faster routes and making shorter work of bosses. This is an improvement of 12.88 seconds over the predecessor movie. Spoiler: Hover over the screenshot. We have a run where Knuckles replaces the main characters and finish the game in record time, and another run where he's going for the max rings challenge. We also have movies in Sonic the Hedgehog, Sonic the Hedgehog CD and Sonic 3 & Knuckles. Every second link leads to a CamHack encode that keeps Sonic visible all the time.